Real Good Fish | FAQ | | FAQ | Bringing you the freshest sustainably caught LOCAL seafood! How frequently do you deliver? We deliver weekly, but you can choose to receive a delivery every week or bi-weekly. 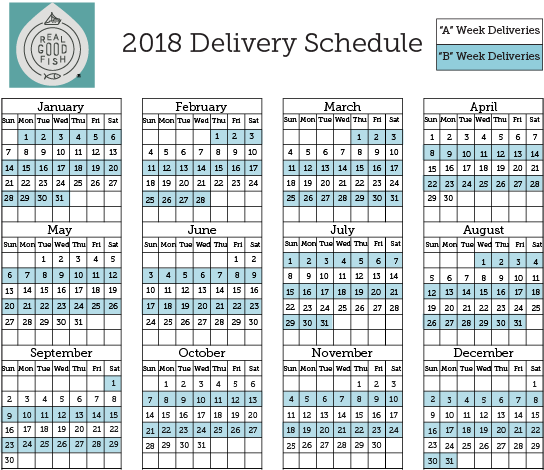 If you prefer a bi-weekly schedule, you can choose from one of two alternating delivery schedules. Our schedule is broken up into "A" weeks and "B" weeks, as shown in the calendar below. Yes, you can skip one or more deliveries if needed! There is no charge for a skipped delivery, provided your account is put on hold beforehand. If possible, we appreciate 48 hours advance notice for delivery holds. Simply log in to your account and click on the "Delivery Hold" tab on the upper left side of the page. Then, click into the "From" and "To" boxes and select the appropriate dates you wish to pause your deliveries. You'll receive an email confirming your hold, and the date of your next scheduled delivery. Include the day before the first delivery you want to miss. This will ensure that you don’t receive the newsletter or text reminder for your skipped delivery day. End your delivery hold on the date of the last delivery you want to skip. This will ensure that you do receive the newsletter the day before your next scheduled delivery. How does your pricing work and how much do I get? With each delivery, you’ll receive one species. We offer three share sizes to meet your needs. Below is a chart outlining share sizes by species. We also offer a once a month Frozen Share, containing 4 fillets (1.0-1.2 lbs. each) that were flash frozen and vacuum sealed by us while still super fresh, for $88.00. Delivered the first full week of every month, it takes up very little freezer space but contains enough fillets for a month, and can be ordered either in addition to a fresh seafood subscription or as a stand alone subscription. Our set price per delivery smooths out costs for you and for the fishermen, bringing stability to a historically unstable marketplace. This stability reduces waste in the system, and allows fishermen to use the most sustainable catch methods rather than the most efficient methods, which are often harmful to the environment. Therefore, the share price for some species may seem expensive, but for others it will be much more reasonable than prices at your local grocery store. In all cases, your seafood will be fresher than you can get anywhere else. We have a one time sign up fee of $20.00 for administrative costs and the mailing of an insulated bag for you to use to pick up your seafood. Our service works through the purchasing power of prepayments from our members. We offer discounted share prices when you prepay for 8 or more deliveries! What if I have an allergy or don't want some kinds of seafood? You can opt out of species that you don’t like or that you are allergic to. Opt out means you DO NOT want to receive a certain species. There is no cost for opting out. If you aren’t allergic, we recommend keeping an open mind and trying diverse types of seafood because you may have never tasted them so fresh! Eating a diversity of seafood supports biodiversity in our ocean and economic diversity for our fishermen and processors. It also helps you grow in your culinary skills and might introduce you to seafood you never knew you loved! However, we understand some things just aren't a good fit for you, and will provide a fresh or flash-frozen fillet alternative, depending on what is available. Simply log in to your account and select "Change" in the Subscription section of your Summary box. Click on the "Options" tab and select the products you’d prefer not to receive, then click "Save." You'll receive an email confirming your opt out. Do you offer a whole fish option? The FULL Share includes 3.0 to 4.0 pounds pounds of whole fish, gutted and gilled, whenever whole fish species are available. The LARGE Share includes 4.5 to 6.0 pounds of whole fish, gutted and gilled, whenever whole fish species are available. Possible species that you can expect whole are rockfish, black cod, petrale sole and sand dabs. Calamari are delivered uncleaned. All other quantities in each subscription are as stated above. What kinds of seafood can I expect seasonally? We provide as much variety as possible! You can maximize your variety with a weekly delivery, rather than the bi-weekly option. We’ve offered over 32 different species throughout the years. How do I know what species I’m getting with each delivery? We email you a newsletter the day before each delivery. It will tell you the species, who caught it, with what gear, and when and where it was landed. It always includes our recommended eat or freeze by date, and any special storage or preparation instructions. The newsletter also has quick links to our fabulous recipes and other products currently offered exclusively by Real Good Fish exclusively in our webstore. Most often, your seafood was caught 1-2 days before delivery. You can’t get it any fresher than this unless you catch it yourself! What is the Member Store? In our delivery newsletter we'll let you know what extra products we have available to purchase in addition to your share. These may be fresh or frozen seafood, housemade seafood products or pastas, or other specialty items. Anything you choose to purchase will be delivered with your share in the cooler, and the cost will be deducted from your account balance. If you're interested in making a purchase in the Member Store, either click a link in your newsletter, or log in to your Real Good Fish account and select "Store." How do I apply my Member Store coupon? After you've added something to your cart, click on the word "Cart." Below your ordered items, click on "+ Add Coupon,” enter the code into the box, and then click "Apply." If you’re a member of our CSF, all you need to do is add this to your account as a Member Store item, or call us at 831-332-1234 for immediate processing. We'll email you the gift certificate(s) to either forward to your recipient, or print and gift, along with instructions to help make your recipient's experience as smooth as possible. If you're not a member of Real Good Fish, you can still purchase a gift certificate. Give us a call to pay for the gift certificate(s) you want at 831-332-1234. We’ll email you the gift certificate(s) for you to print and give to your recipient(s) or to forward to them, along with instructions to help your recipients get set up with our service. Can I get a reminder on my delivery day? Yes! You can add our free delivery day text reminder, which will go to the primary number listed on your account. You will be notified at 11:00 a.m. on delivery days so you never forget to pick up your share. To set up a text reminder, log in to your account. In the Summary box, click “Change” in the Subscription section. Click on the “Options” tab, find the “Text Reminder Day of Delivery” option, select the same schedule your subscription is on, and click “Add.” Save your changes and you will begin receiving text reminders with your next delivery. What if I can’t find my share in the cooler? First, check the cooler a second time, all the way to the bottom. If you still can't find it, look over the checklist to see whether anyone who has already checked off still has a share in the cooler. If so, that means they've taken your share by mistake and you can take theirs. If this isn't the case, please contact us as soon as possible: 831-332-1234 or member@realgoodfish.com. What if I go to the pick-up and my name is not on the list? If this is the case, please call or email us immediately at 831-332-1234 or member@realgoodfish.com. We’ll help you sort it out. Check your site instructions (under “Pick Up Directions” when you log in to your account) to see if there is a missed pick up policy in place. Contact us if you need help getting in touch with your site host. What if I don't know how to cook a certain species? We include recipes and how-tos with each newsletter. We also have a website full of recipes, cooking tips, and videos. Have a look around and begin your next culinary adventure! Check out our recipes here! Can I become a site host? We usually need a minimum of 10 friends, family members, neighbors & coworkers signed up to begin deliveries at a new site. And to make a site sustainable, we need 20 members or more. We’ll do follow up marketing to support a new site, and we occasionally ask our site hosts to spread the word via Nextdoor.com, Facebook, or other social media to help build membership. If you're interested, please email us at sitehost@realgoodfish.com. We’d love to talk! What is involved with hosting a site every week? Our site hosts receive a discount on their choice of a Half Share, Full Share, Large Share, or Frozen Share, which can be delivered weekly, every other week, or once a month in the case of the Frozen Share. The discount amount is tiered, and grows as member numbers grow. All we ask in exchange is rinsing and air drying the cooler between deliveries, and fielding the occasional email or phone call about pick up issues. We keep that to a minimum by setting missed pick up hours the day after delivery, so there really isn't much to do. Contact us for more information at sitehost@realgoodfish.com. Do you deliver to offices, business or institutions? Yes, we have businesses large and small hosting delivery locations, as well as schools and universities. Some are only accessible to their employees or students, others are open to the public, increasing their presence in the community, and in some cases, their sales. Want to set up one at your office, business or workplace? E-mail us at sitehost@realgoodfish.com. What are the health benefits to eating seafood? Seafood has ample essential nutrients like iodine, selenium, zinc, and potassium, which help with thyroid issues and protect you from cancer. Fish and shellfish are also excellent sources of many vitamins, including vitamins A and D.
Seafood is great for your heart, and decrease chances of heart disease by lowering cholesterol. Eating fish regularly eases symptoms of rheumatoid arthritis. Seafood keeps your eyes bright, and protects the eyesight of those suffering from age-related macular degeneration. Seafood has healthy fatty acids that can keep dementia at bay. Seafood also has high levels of omega-3’s that actually boost your mood, improve your skin and hair, and make you smarter. Did we miss anything? Oh yes, it also increases your libido! I am pregnant. Should I eat seafood? Eating seafood when pregnant contributes to intelligent, healthy and calm children. Studies have shown an increased verbal IQ of 7.55 points in children whose mothers ate seafood during pregnancy. (Not fish oil supplements, however. Read this article in Psychology Today for more information.) Children of seafood-eating moms also had lower hyperactivity. Pregnant women DO want to avoid eating fish high in mercury, which includes the large fish like ahi tuna, swordfish, king mackerel and tilefish. We require a minimum commitment of 4 deliveries. You can cancel any time after that. You must email us to cancel at member@realgoodfish.com. If you have a remaining balance in your account, we will plan on delivering your remaining shares unless you specifically request to be refunded instead. You are financially responsible for all deliveries made until you email us to cancel your subscription and close your account. To view our member polices please click here.